The New York Giants have released place kicker Josh Brown a week after new revelations about his past domestic violence issues. Brown was placed on the NFL’s Reserve/Commissioner Exempt List last Friday and did not play against the Los Angeles Rams in London on Sunday. “We believed we did the right thing at every juncture in our relationship with Josh,” said Giants President/CEO John Mara in a statement. “Our beliefs, our judgments and our decisions were misguided. We accept that responsibility. “We hope that Josh will continue to dedicate himself to rehabilitation, and to becoming a better person and father. We will continue to support him in his efforts to continue counseling, and we hope that Josh and his family can find peace and a positive resolution. The New York Giants have re-signed quarterback Logan Thomas to the Practice Squad and terminated the Practice Squad contract of long snapper Tyler Ott. Ott was originally signed as an undrafted rookie free agent by the New England Patriots after the 2014 NFL Draft. He did not make the team, but spent time with the Patriots again and the St. Louis Rams before the 2015 season. The Giants signed Ott in late December 2015 and he played in the regular-season finale. The Giants waived Ott in late August and signed him to the Practice Squad last week. The players will be off Wednesday through Sunday before returning to practice next Monday. 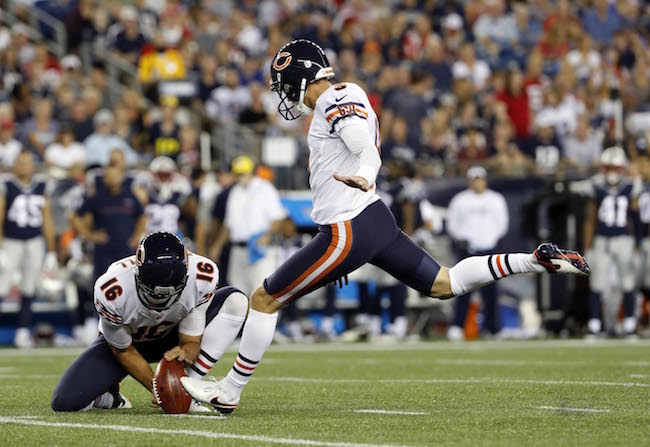 The New York Giants have signed place kicker Robbie Gould to a 1-year contract. Gould will kick for the Giants on Sunday in London against the Los Angeles Rams. Place kicker Josh Brown did not travel with the Giants due to the public outcry surrounding new revelations about his past domestic violence issues. Brown has been placed on the NFL’s Reserve/Commissioner Exempt List. While he will still collect his salary, Brown will not count against the team’s 53-man roster limit. The 34-year old Gould was originally signed as an undrafted rookie free agent by the New England Patriots after the 2005 NFL Draft. After brief stints with the Patriots and Ravens, Gould signed with the Chicago Bears in October 2005. He played 11 seasons with the Bears (2005-2015). In his last season in Chicago, Gould was 33-of-39 (84.6 percent) on field goals. Forty-seven percent of his kickoffs resulted in touchbacks. Safety Darian Thompson (foot), safety Nat Berhe (concussion), and offensive tackle Marshall Newhouse (calf) have been officially ruled out of Sunday’s game against the Los Angeles Rams. Long snapper Zak DeOssie (ankle) is “questionable” for the game. Wide receiver Odell Beckham, Jr. (hip), cornerback Eli Apple (groin), cornerback Trevin Wade (ankle), defensive Olivier Vernon (wrist), linebacker Keenan Robinson (knee), and running back Rashad Jennings (finger) are “probable” for the game. The transcript of Ben McAdoo’s press conference on Friday is available in The Corner Forum while the video is available at Giants.com. The weekly exclusive Giants.com Q&A session with McAdoo is also available. There is no press availability to the Giants on Saturday. The Giants play the Los Angeles Rams in London at 9:30AM ET. New revelations about New York Giants place kicker Josh Brown’s past domestic violence issues have been made public. The ensuing public relations firestorm has caused the Giants to announce that Brown will not be traveling to London with the team for Sunday’s game against the St. Louis Rams. Brown was already suspended without pay for the first regular-season game, but now the league has announced they are considering further sanctions. The Giants have not announced who will replace Brown on Sunday. 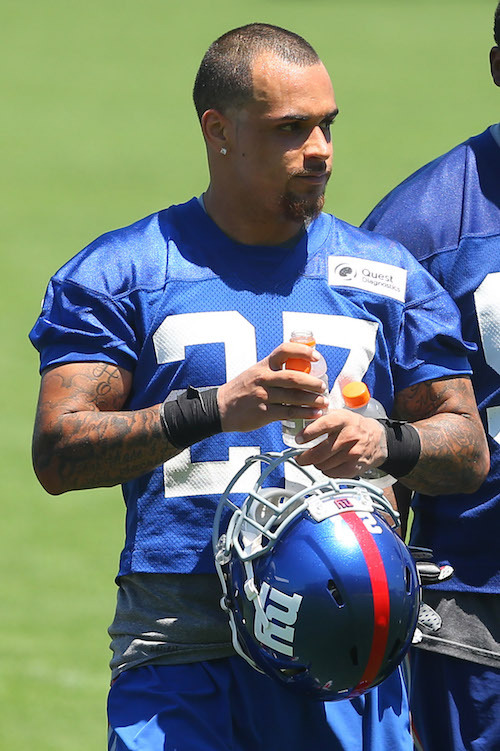 Safety Darian Thompson (foot), safety Nat Berhe (concussion), and offensive tackle Marshall Newhouse (calf) did not practice on Thursday. Wide receiver Odell Beckham, Jr. (hip), cornerback Eli Apple (groin), cornerback Trevin Wade (ankle), linebacker Keenan Robinson (knee), and long snapper Zak DeOssie (ankle) practiced on a limited basis. “I feel better than yesterday, so we will see,” said Beckham. Defensive Olivier Vernon (wrist) and running back Rashad Jennings (finger) fully practiced. 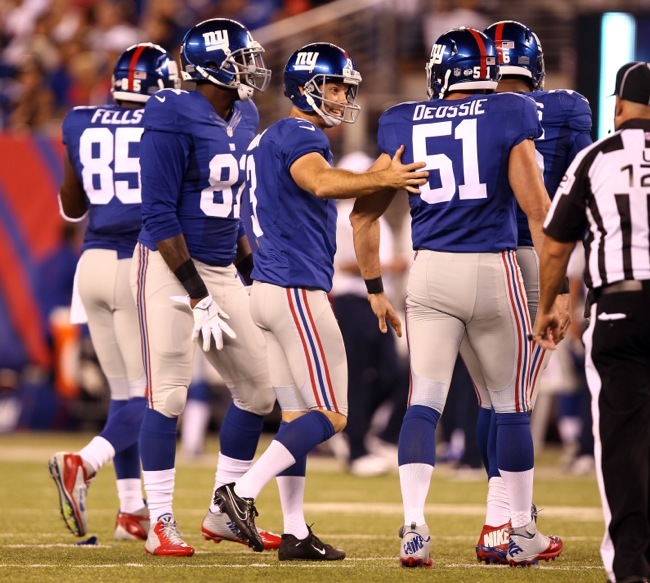 The New York Giants gutted out a 16-13 win over the New Orleans Saints at MetLife Stadium on Sunday afternoon. The game-winning 23-yard field goal was kicked by Josh Brown as time expired on the clock. The victory improved the Giants record to 2-0, the first time the team has started the season with two wins since 2009. Remarkably, the Giants beat the high-powered Saints without scoring an offensive touchdown. 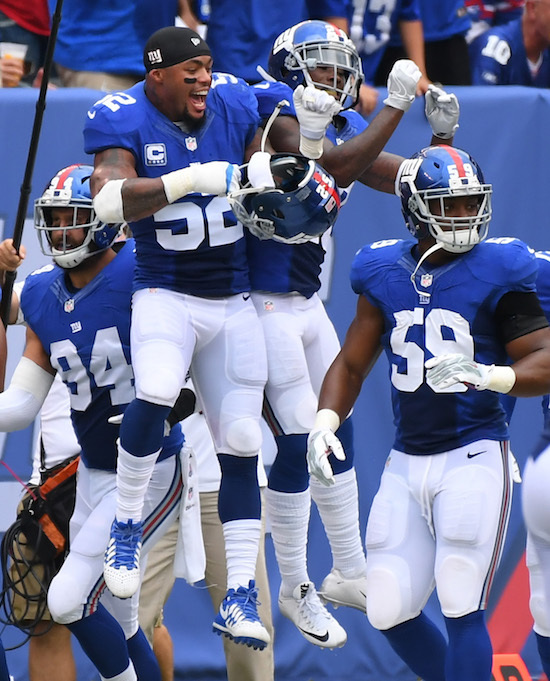 The Giants dominated the stat sheet, out-gaining the Saints in first downs (22 to 16), third-down efficiency (47% to 23%), total net yards (417 to 288), net yards rushing (64 to 41), and net yards passing (353 to 247). But the Giants fumbled the ball away three times (for a -3 turnover differential) and were halted on a 4th-and-goal attempt. The story of the game for the Giants was their defense and special teams. In seven first-half possessions, the Saints only gained six first downs. They punted the ball away five times, had a field goal blocked, and kicked another field goal with their only productive drive of the first half (11 plays and 54 yards). Meanwhile, the Giants offense bumbled and stumbled in the first half even though the team punted the ball away only once (on their first drive). The Giants had an impressive 14-play, 80-yard possession end on 4th-and-2 at the 3-yard line with an incomplete pass to wide receiver Odell Beckham. Then came three straight offensive possessions with fumbles – one each by running back Shane Vereen, wide receiver Victor Cruz, and quarterback Eli Manning. The drama began after Manning’s fumble which gave the Saints the ball at the New York 25-yard line. The defense held and forced New Orleans to attempt a 38-yard field goal. Defensive tackle Johnathan Hankins blocked the attempt. The loose ball was picked up by cornerback Janoris Jenkins who then raced 65 yards for the first score of the day for either team with 2:30 to play in the 2nd quarter. The Saints then responded with their one scoring drive of the first half. At the break, the Giants led 7-3. The Giants missed a 53-yard field goal and the Saints punted early in the 3rd quarter. The Giants then put together an 11-play, 54-yard drive that ended with a 48-yard field goal by Josh Brown. The Saints responded late in the 3rd quarter/early in the 4th quarter with a 9-play, 74-yard drive that ended with 17-yard touchdown pass by quarterback Drew Brees. The score tied the game at 10-10. The Giants immediately followed this up with an impressive 11-play, 74-yard drive that unfortunately stalled at the 1-yard line after facing a 1st-and-goal from the one. Brown’s second field goal of the day gave the Giants a 13-10 advantage with 8:46 to play. After both teams exchanged punts, the Saints tied the game after an 8-play, 47-yard drive set up a successful 45-yard field goal with 2:54 to play. Then came the game-winning possession by the Giants as New York drove 70 yards in 11 plays. They converted two 3rd downs, including a 6-yard pass on 3rd-and-1 to wide receiver Sterling Shepard and a 34-yard pass to Cruz on 3rd-and-8 down to the Saints’ 2-yard line. After three kneel downs by quarterback Eli Manning, Brown kicked the game-winning 23-yard field goal with no time left on the clock. Offensively, Manning finished the game 32-of-41 for 368 yards, no touchdowns, and no interceptions. His leading receivers were Shepard (8 catches for 117 yards), Beckham (8 catches for 86 yards), and Cruz (4 catches for 91 yards). The leading runners were Vereen (14 carries for 42 yards) and Rashad Jennings (13 carries for 27 yards). Defensively, the Giants did not force a turnover for the second game in a row. 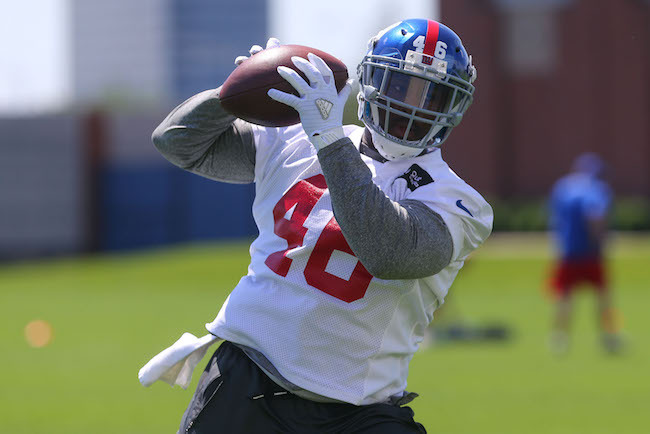 The first sacks on the year were generated by safety Landon Collins and cornerback Leon Hall. Inactive for the game were defensive tackle Robert Thomas (illness), quarterback Josh Johnson, running back Bobby Rainey, running back Paul Perkins, wide receiver Roger Lewis, offensive tackle Will Beatty, and defensive tackle Montori Hughes. Safety Mykkele Thompson injured his knee and right tackle Marshall Newhouse strained his calf in the game. Neither returned. Newhouse was seen after the game with his right foot in a boot. 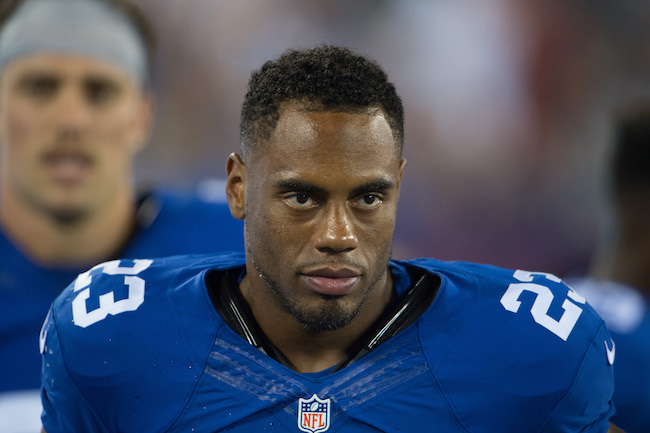 Running back Rashad Jennings had x-rays after the game and his hand was heavily wrapped. The Giants have won six consecutive games when holding the opposition to fewer than 20 points. 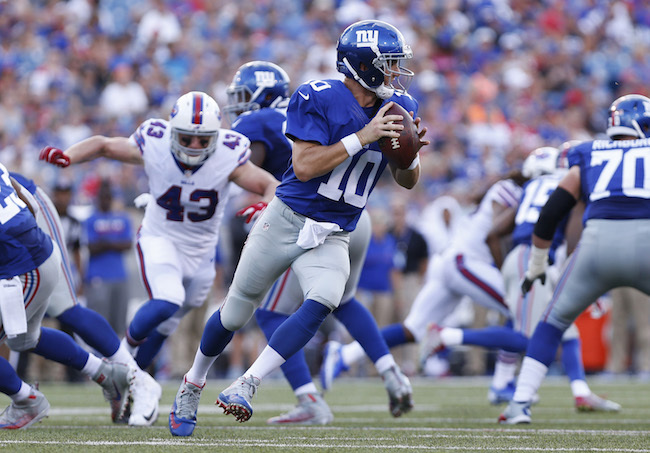 The Giants improved to 50-39-3 in home openers, including 3-4 in MetLife Stadium. Ben McAdoo joined Dan Reeves (1993) and Joe Alexander (1926) as the only head coaches in franchise history to win their first two games as a Giants head coach. This was the 30th game in which quarterback Eli Manning led the Giants to victory when they were tied or trailing in the fourth quarter. Manning’s career yardage total increased to 44,762. That moved him past Drew Bledsoe (44,611) and into 10th place on the NFL’s career list. The Giants scored on a blocked field goal for the first time since December 7, 2008, when cornerback Kevin Dockery scooped up a blocked attempt by Philadelphia’s David Akers and returned it 71 yards for a score. The New York Giants have re-signed quarterback Logan Thomas to the Practice Squad and terminated the Practice Squad contract of linebacker Deontae Skinner. Thomas had been cut from the Practice Squad on Tuesday to make room for Skinner. Skinner was originally signed as an undrafted rookie free agent by the New England Patriots after the 2014 NFL Draft. He has spent time with the Patriots (2014-2015) and Eagles (2015-2016), the latter waiving him on August 22. The New York Giants have placed linebacker J.T. Thomas on Injured Reserve with torn ligaments in his left knee. Thomas was injured on the final play of the second quarter on special teams. 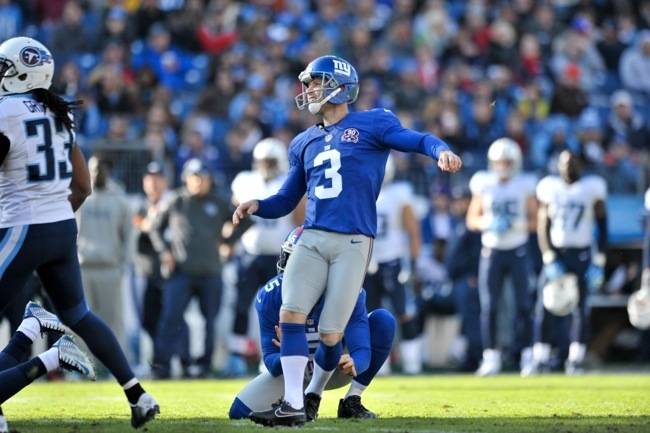 The vacant roster spot was filled as place kicker Josh Brown was reinstated by the NFL after his 1-game suspension for a 2015 domestic violence incident. “Josh will be the kicker this week,” said Head Coach Ben McAdoo today. New York Giants Head Coach Ben McAdoo addressed the media by conference call on Monday to discuss the team’s 20-19 win over the Dallas Cowboys. 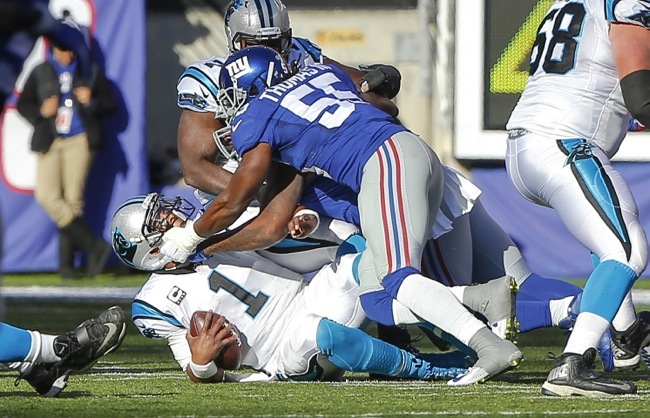 McAdoo: We will start with what we did well on the defensive side of the ball. We were physical and heavy-handed at the line of scrimmage. I thought we showed poise to hang in there with the number of plays that we played. They showed signs of being comfortable being uncomfortable, which is encouraging. Obviously closing the game out in the fourth quarter was a huge positive for us. On the offensive side of the ball, we handled the noise. There were some great shots of tempo over the ball. Physicality and heavy-handed at the lines of scrimmage with some signs of finish at the end of the runs and at pass protection. Really on both sides of the ball in the green zone, red zone and two-minute, we won those situations. When you win those situations, you have a chance to be ahead when the ballgame is over. On special teams, the 17-yard punt return in the fourth quarter was big for us. Set up great field position and the go-ahead touchdown, which was a major impact in the game. What we need to work on defensively, we need to get off the field on third down. We had some opportunities to do that and we need to cash in on them. We need to take The Duke away and get our hands on some footballs on defense. There were some opportunities there. On offense we need to eliminate our pre-snap penalties. We had two. There were times that we were careless with The Duke. We have to take care of The Duke better. Special teams, our kickoff return blocking needs to shore up. Where we go from here, we need to stay humble and hungry, improve on our communication and details and be precise in everything we do. Like every team in this league, you are looking to take that jump from week one to week two. With that, we’ll open it up to questions. Q: What are you going to do with the two kickers? A: Josh (Brown) will be the kicker this week. Q: Will you still have two when it’s game time? A: Right now we have two kickers on the roster. That could change shortly. We’re in the process right now of evaluating. Q: How big is that jump from week one to week two when you look at it throughout your years in the league? A: I think it’s important. No team is really quite sure what you’re going to get in week one. Every team changes each year. There’s a lot of turnover season to season. You have an opportunity to go out and play the game together in a full game. You have the chance to take a big jump in the second week. Q: How do you prepare your team to make that jump? A: We have to go in and make the corrections from the first game. Emphasize the positives. Go out, practice and make the corrections. Move forward. Q: Can you talk about how the defensive line did against that tough Dallas offensive line? A: I thought the defensive line did a nice job in there. They had a lot of snaps. It’s a very good offensive line that they faced. We were physical, held the line of scrimmage and were heavy-handed. We limited the yards after contact. Q: Do you think having Janoris Jenkins on Dez yesterday is a sign of things to come as far as your confidence in having Janoris go against the top guys on other teams? A: I think Janoris had a heck of a day yesterday. He’s not the only one that was matching up against Dez. DRC made a couple of really nice plays there, too. Jackrabbit really shadowed him for the most part of the day. He competed his tail off and it was a big, huge effort for us. Just like everything else, each week we’re going to take a look at it and see how we match up. We’ll go from there. Q: There was some mention after the game about the sun being a factor. How much did you notice that? Did you notice that at all? A: We talked about that going into the game. We had some pictures from the past, from the 2014 game. We noticed how it shines in from the west in the second quarter and then into the third and fourth quarters. If you have a chance to help yourself in the kicking game and offense and defense with the glare and if you don’t, you have to learn to play through it. Whether you’re looking into it or it’s at your back, it’s going to impact both sides of the ball. If you’re a quarterback and it’s in your eyes, it’s better for the receivers that way but it’s tougher to read the coverage and vice versa. Q: How much is that something you tried to navigate if you were on a certain side of the field late in the game? A: It depends on how the coin toss goes. That really impacts everything. You can’t control the coin toss. Some people like to think that you can but you can’t. You have to roll with the punches after the coin toss. Q: What did you think of Eli Apple’s debut? Seemed like he was a little behind on a few routes guarding Cole Beasley? A: I think he was feeling his way early. He got his feet underneath him as the game wore on. Really competed at a higher level as the game wore on. Just like a lot of young players, they have to feel their way a little bit at times. You play through it and I think he made some nice tackles as the game wore on. Q: What did you think of DRC in the slot? A: I think he made two very nice plays in the slot. One was in the end zone and the other was on an inside fade route to Dez. I think he did a tremendous job there and we liked him there. Q: Did you like him as a blitzer? A: Yes, we liked him as a blitzer. I think the more he does it, the better he’ll get at it. Q: A lot of attention to the defensive front but we’ve now asked you a lot of questions about the secondary. Do you feel like you held up well in the secondary yesterday? A: I feel like we’ll get better as the season goes on at third down. We just need to find a way to get off the field. Q: Would you like to add another linebacker with J.T. Thomas now on injured reserve? A: We’re going to take a look out there, have some conversations and see what’s best for us moving forward. It’s preliminary to have that discussion right now. Q: Is bringing Jasper Brinkley back a possibility in your mind? Q: What did you wind up doing with your game ball? A: I gave it to our equipment guys. They’re going to take care of it for me. Not sure what they’re going to do with it. It’ll be a prized possession, that’s for sure. Q: Ben what is your postgame routine like? Are you watching film on the plane home? How do you go about reviewing the game immediately after it ends? A: I look at all three phases and grade them accordingly. Q: Is there anyone else that came out injured in this game that you have to worry about? A: Other than J.T.? No. We have some guys that will be limited right now, but no. Not only was the Giants opening day win their first since 2010, but it was their first opening day road victory since 1999. The Giants are now 1-7 in season openers versus the Cowboys. The Giants are now 4-4 at AT&T Stadium. Player interviews will be held late Tuesday afternoon. The Giants return to practice at 11:40AM on Wednesday. The New York Giants announced on Monday that rookie safety Darian Thompson, who was the clear-cut favorite to win the starting free safety job, injured his shoulder during the 21-0 loss to the Buffalo Bills on Saturday. Thompson will be evaluated on a “week to week” basis according to the team. In addition, tight end Matt LaCosse also injured his knee and will be evaluated on a “day to day” basis. The New York Giants have signed free agent place kicker Randy Bullock. To make room for Bulluck, the team waived place kicker Tom Obarski. Bullock was originally drafted in the 5th round of the 2012 NFL Draft by the Houston Texans. He played in 35 consecutive regular-season games for the Texans until he was released in late September 2015. Bulluck then served as the New York Jets place kicker for eight games in 2015. Overall, Bullock is an 80.6 percent field goal kicker with 47.4 percent of his kickoffs resulting in touchbacks. In 2015, Bullock made 19-of-23 field goal attempts (82.6 percent). The Giants signed Obarski to a reserve/future contract in January 2016. Obarski was originally signed by the Cincinnati Bengals as an undrafted rookie free agent after the 2015 NFL Draft, but he did not make the team. Obarski missed a 27-yard field goal on Saturday against the Buffalo Bills. Josh Brown has been suspended for one regular-season game without pay for violating the NFL Personal Conduct Policy (domestic violence incident in 2015). Brown will miss the opener against the Dallas Cowboys. The team will hold practice on Tuesday at 11:45AM.